Readers notice spelling errors. There is no way around that fact. Don’t fall victim to the notion that “spelling doesn’t count.” That may fly in some educational circles, but it is not the conventional wisdom in most academic and business situations. Some writers recommend composing text with automatic spell check turned off. They advise only running the spell checker when the piece is complete. Other people prefer to make the spelling corrections as they go along. Either method works. Use the one with which you feel comfortable. Spell check is a tool. Like all tools, it has its limitations. For one thing, spell checkers in word processing software such as Word and OpenOffice Writer only contain a subset of all the words found in standard dictionaries. If the word processing system flags something as wrong, don’t be afraid to get a second opinion. A great tip is to keep a browser tab open to Dictionary.com. You can easily click over to the site and check any word that you want to verify. The next challenge with spell check is its lack of context verification. The system checks each word individually. That might work fine if you were just creating lists of words for a spelling bee, but it’s not so practical in real usage. The problem is homonyms (words that sound the same, but are, pronounced differently and have different meanings). These pesky word twins and triplets can wreak havoc on writing. Meanwhile, spell check assures the writer that he or she spelled all the words correctly. The spellings probably are right, if they were in isolation. They are just not correct in context. How do you compensate for these homonym challenges? Consider which ones with which you trouble. Is it “there” versus “their?” How about “it’s” versus “its?” Or grasping the difference between “then” vs “than.” After completing your writing, search for the problem words using the software’s search feature. You can quickly scan and check each instance of a problem word in its context that way. If homonyms are a particular challenge in your writing, there are even software solutions to help you sort things out. Both commercial software and no cost open source software exist to tackle the issue. The software works by searching for and highlighting all the possible words that have homonyms in a piece of writing. From that point on, you can verify the accuracy of each one if you know the correct form. If you are unsure, you can look up the definition of the choice you made to confirm it was the right one. No discussion of spell check would be complete without talking about the closely related feature of AutoCorrect. Don’t even think about leaving that feature on while writing! Your friends may be amused by the silly and embarrassing phrases produced by AutoCorrect in cell phone text messages. However, teachers and customers won’t find it so funny in academic and professional work. 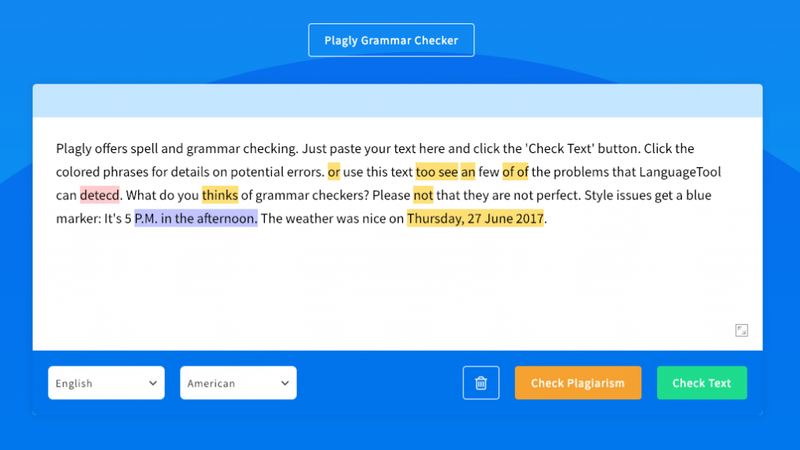 Use the spell checking feature by Plagly or your word processing software. Realize, though, spell check is only one tool which has its limitations. Nothing replaces your keen eye and careful attention when it comes to ensuring your work is as error-free as possible. This entry was posted in Grammar, Spelling, Writing and tagged autocorrect, check, homonym, software, spell, word. Bookmark the permalink.